I’m happy to announce that our Free Online Course (MOOC) will be starting again on 3 October 2016. If you missed our first two runs, here’s your chance to take it. If you took the course already, you’re welcome to come back for the conversation. The free course is set at an entry/general public level, but we’re presenting the results of very recent research. The topics are challenging and the discussion is intense, but invigorating. I know I am looking forward to it. 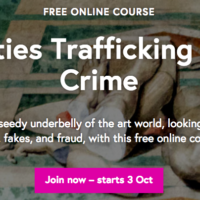 There are still a little less than two weeks to enrol in our higher master’s level online courses at the University of Glasgow, the Postgraduate Certificate in Antiquities Trafficking and Art Crime. If this is something you are into, you’ll have to hurry. These are full postgraduate classes that bear credit and all that. I have some FAQs about all of this which might answer your questions.